It has been a while since I posted, so I thought I would just ramble a little bit today. We have had typical, but busy lives here lately. Paul's work is going well, but busy. That is a two-edged sword for us. We are thankful for the blessings of the business being successful, but it comes with the price of time. I just feel for Paul, because his life outside of work doesn't stop and wait when work gets busy. I know it is a challenge for him to balance family, chores, hobbies and everything else that has to be squeezed into the few hours that remain each day after work. Exhaustion also plays it's part in trying to sort it all out!! Despite the challenges of long work hours, I do have to say I am so pleased and blessed with where our relationship is at. We were just reflecting this week how, after 14 years (on Oct 16th), we don't really sweat the small stuff any more. We have both grown a lot, especially in the last 5 years or so, to the point that what would have been a blow-up in the past, just amounts to almost nothing now. We both feel a peace in our relationship about the fact that we are here to stay. No matter the seasons or speed bumps, we will get through it all, together. 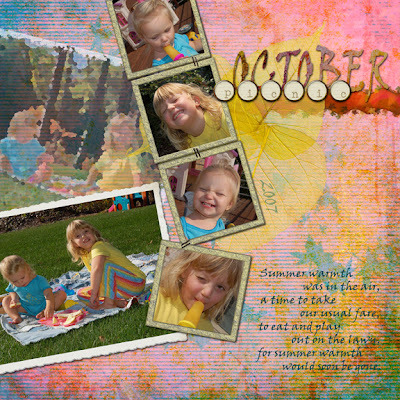 I have been busy with the girls, my Bible study and, of course, scrapbooking. My bible study is going well. I am so encouraged by the feedback I receive weekly from the moms. I really feel like God is using this study in the lives of these women and myself, and that is what it is all about. The girls are still their typical crazy selves! Sage is really starting to say and comprehend a lot! There was a time when we were thankful she was so cute, because we weren't so sure if the elevator was going all the way to the top!!! But she is really learning and displaying signs of understanding a lot now! My favorite part of her learning right now is that she understands the 'barter' system when it comes to eating! If you want this, you have to eat that. Typically it is if you want fruit, you have to eat your meat! The other night wasn't such healthy choices though, when I was bartering smarties for mac and cheese! My how spoiled the second one is!! Regan is very excited to be going to Cubbies (Awana) at The BIG Church (Calvary). I am so thankful for this, because she wasn't so excited initially. I am excited for her to grow up memorizing scripture, a big part of the Awana program. It is something I wish I had more of growing up. Well, I pray you are all as blessed as we are! I guess it is the season to start thinking about what we are thankful for!! You have to love when you can wear shorts and have an outdoor picnic and popsicles on October 8!! These are photos from Monday! I figured we better enjoy it, before our picnics relocate to the living room floor! Today is definitely feeling more like fall. My thermometer in my car said 36 deg when we left this morning! Brrrrr!!!! I do love this time of year though. Paul started the fireplace this morning, the sweaters and turtlenecks come out of hiding. The leaves changing color...it is all just fine by me! I like living where there are seasons, instead of just warm and warmer! It makes you appreciate things more, I think! While we were having our fun outside, a lot of leaves and acorns were falling off the trees. Regan said "Look Mommy, it's the first day of fall....everything is 'falling' off the trees!" Those who know me, know that I love to try new things, take on new business ventures. Well, then it should come as no surprise that I am starting a new business venture, and this one excites Regan very much! I am testing out the 'home party' concept for a dress-up company called 'Little Adventures'. They provided me with a 'trunk' of dress-up close in return for my agreeing to have four parties where moms and children come and dress-up and hopefully buy some products. When I consider any new adventure, I always weigh the financial impact it would have on my family. Well, this was a no brainer! 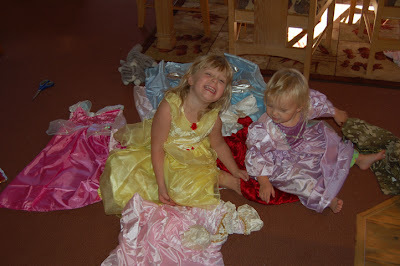 For a little bit of time and effort, Regan and Sage get a whole closet of wonderful dress-up clothes. If things go well, maybe I can even make a little money! The best part is, it is something I can do with the girls. I already have two parties booked and have tons of ideas to develop the 'home party' concept for the product. Meanwhile, I have one excited little girl in my house. When she woke up this morning (my samples came yesterday), she said 'Mommy, are we going anywhere today?' 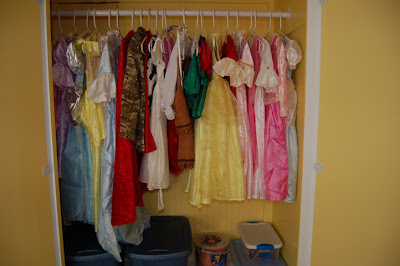 - 'Good, then I don't have to get dressed, I can go put my Belle dress on!' Her and Eden spent pretty much the whole morning in and out and in and out of all of the dresses! So many dresses, so little time! !